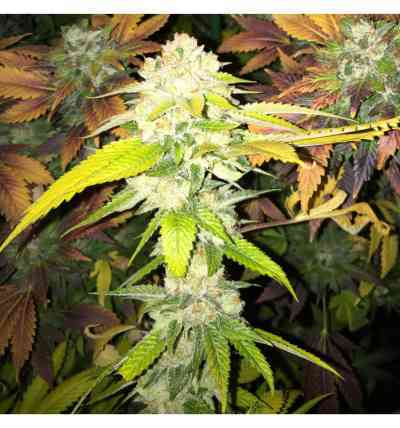 Double Banana Sherbet from The Plug Seedsbank are feminized seeds with 75% sativa dominance. For their development, the breeders combined a powerful mother Sour Banana Sherbet from Crockett Family Farms with a delicious Strawberry Banana Cream. The result is a great tasting variety and a beast in any form of resin extraction, both for yield and for its unique terpene profile. Outdoor, this plant grows with great vigor from the first moment, with a typical Christmas tree structure. 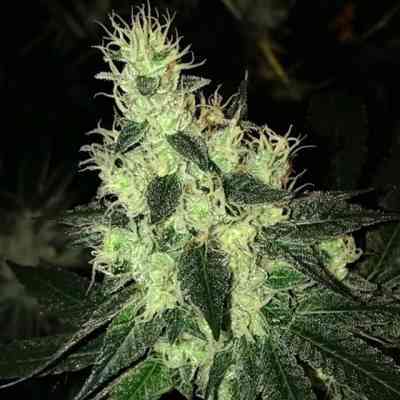 Its thick branches will be filled with huge buds that will gradually be covered with a thick and fragrant layer of bright trichomes. It is possible that towards the end of flowering supports are needed to support the weight of the flowers. It is harvested during the second fortnight of October. Indoors, it is perfect for SCROG and SOG crops, as it has the same ease to branch strongly when pruned or guided, and to concentrate the production in thick and long tails if starting from small cuttings. From the change of photoperiod to 12/12, complete flowering in 9-10 weeks, with yields between 475 and 550 grams per m2. The odours are very penetrating and it is advisable to use a good anti-odour system.